For a medium sized project, consider these time capsules and plaques. Time capsule containers here are stainless steel and range from 12x12x12" to 14x14x20". Packages include the correct size preservation kit. Plaques are 8x10" to 12x12", with aluminum being the default choice and bronze available for additional charge. 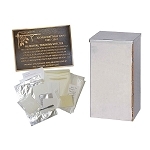 Pluto time capsule package includes stainless steel time capsule box, preservation kit and plaque. Time Capsule & kit ship first.